The reed is ngetal in ogham. The month of ngetal includes samhain. 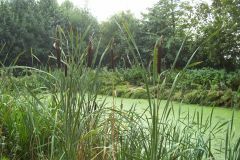 This picture on the right shows bullrushes, which are also considered within the class of this Ogham letter. 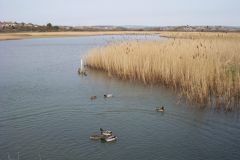 Reeds often grow as reed-beds, as shown on the left, which is near a river estuary (Weymouth).